JayWalk - All Your Xmms Are Belong To Me: The Multi Purpose Of Umbrellas, NOT! I was reading Ah 9's entry about using umbrella to chope seat when I remember my own chope seat umbrella anecdote. T'was the year when it was more than a decade ago. It was early in the evening where I was at the Victoria Theatre attending a play (Chang & Eng?) with Pam (I think it's you, Pam). Now Pam and I were the model citizens of theatre-hood for we were always on time, if not early. Anyway, we arranged to meet up earlier and have a quick bite at the cafe below the theatre (Violet Oon's Theatre Cafe, ring a bell?). That way, we get to avoid the mad rush of cars coming into the carpark and fighting for that precious piece of real estate and also avoid the mad rush of cars getting out of the CBD, for the Victoria Theatre is smack in the middle of it. So at around slightly before 6pm, I pulled into the theatre's carpark and found my perfect parking spot right in front of the cafe. However, there was just this one little problem. There was an umbrella in the middle of the lot. Har? Parking space also must chope with umbrella one har? Might as well throw in a pack of tissue paper for good measure in case the wind blew the umbrella away. I contemplated in the car for quite a while what to do with the offending umbrella. Do I get out of the car to move the umbrella aside? Do I fold the umbrella while I am at it? What do I do with the umbrella thereafter? Do I place it against the wall? Do I just chuck it on the lawn? Do I go "Hey Girl! I got you an umbrella! " My mind was racing through every single permutation and combination as if I was Deep Blue processing my next move against Kasparov. Shortly after. The processing was completed. I made my next move. I drove the car over the umbrella. Really not surprise you do tat! Anna: Yah, it did. The underside of my car kena scratch by the underwire of the brolly. Other than that, I think my car got away scratch free. Maybe because it was drizzling and the vandal lazy to come out and scratch my car. AgentX: Long time no see! Hope all's well with you. 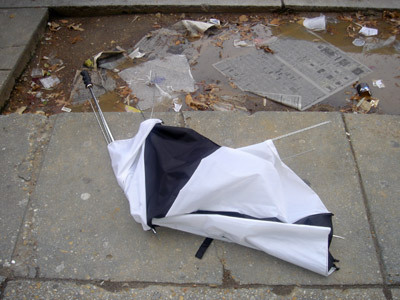 Anyway, you may be right about the fact that it could be just a discarded umbrella. 1) It was placed nicely in the middle of the lot. Not an inch adrift but smacked right in the middle. 2) It may be drizzling that evening but if I recall correctly, there weren't strong winds. Akk: Indeed I am. I made sure I pull into the carpark lot fast fast so as to minimise the suffering of the umbrella.